There are 44 actives forest fires in the region, 19 of which are not yet under control. Good morning from Sudbury! Here's our latest story on forest fires in northeastern Ontario. Parry Sound 33 was remapped at 11,362 hectares (177 hectares more than we knew yesterday morning), but the MNRF says crews managed to hold the perimeter of the fire Saturday despite hot, dry weather and high winds. No changes to report on the Lady Evelyn fire cluster. 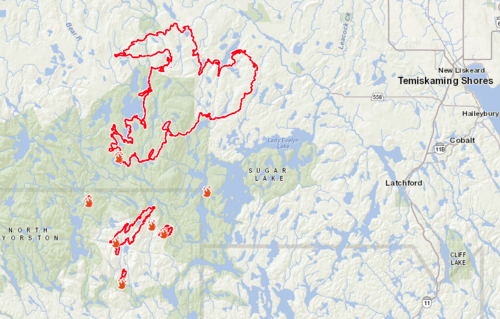 It is still not under control at 27,285 hectares. Although the fire known as Parry Sound 33, south of Sudbury, Ont., seems to have grown, the Ministry of Natural Resources and Forestry says crews managed to hold the perimeter of the blaze on Saturday, despite a combination of high winds and temperatures and low humidity. CBC reporter Christina Jung was out bright and early at the base camp in Britt where crews working on Parry Sound 33 are stationed. On every story we share on Facebook, there are so many comments from people thanking the crews out fighting these fires. Here are some pictures from across the province the MNRF shared this morning. 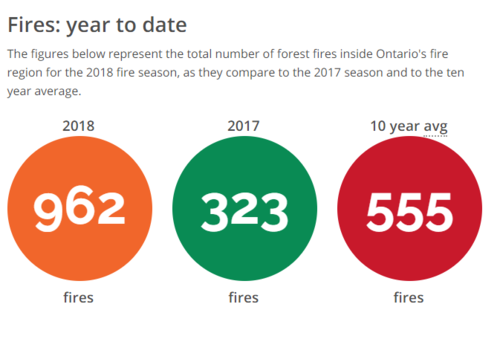 Here's a great graphic from the MNRF that offers some perspective on the 2018 fire season. 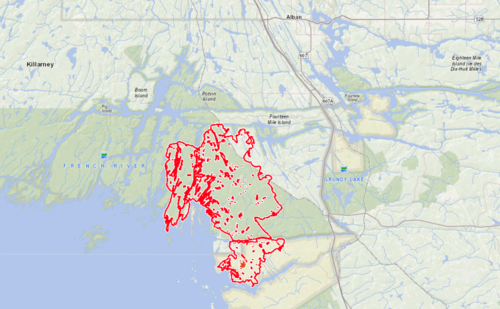 You can find this perimeter map of Parry Sound 33 on the MNRF's interactive fire map. Although there have been a lot of misconceptions about where the fire actually is, the town of Parry Sound is still quite a ways south down Highway 69 (the thicker grey vertical line). You can see Alban near the top centre (east of the highway), where an evacuation alert was issued by the Municipality of French River earlier in the week. To the left (west of the highway) you'll see the Municipality of Killarney. An evacuation order was issued by the municipality last week for the following areas: Travers, Allen, Struthers, Kilpatrick, Bigwood (including Hartley Bay Road), a portion of Mowat, the Unsurveyed Area, 14 Mile Island and French River Provincial Park. Speaking of perimeters, here's a look at the Lady Evelyn Cluster. The largest mass is North Bay 72, which is sitting at 27,285 hectares. Fun Fact: The MNRF says more than 300,000 feet of hose has been used in fire suppression and structure protection for Parry Sound 33. 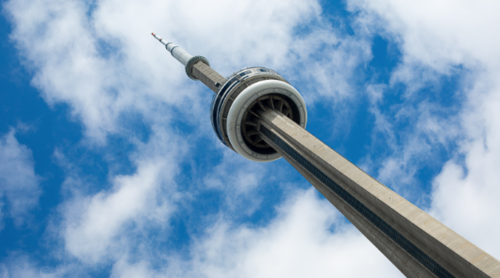 That's 167 CN Towers worth of hose. More from reporter Christina Jung's visit to the Britt base camp this morning. 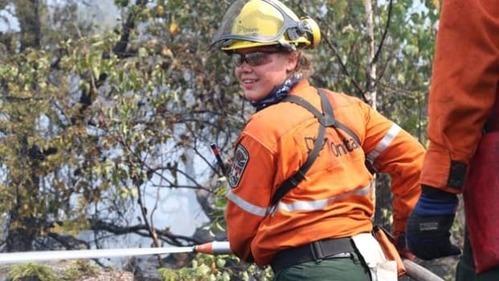 I just got off the phone with fire information officer Isabelle Chenard, who says crews have made good progress over the last couple of days on fires in the region. There could be some good news for Parry Sound 33 in particular, as rain is in the forecast for the coming week. Also of note, one new fire was identified today called Sudbury 101. 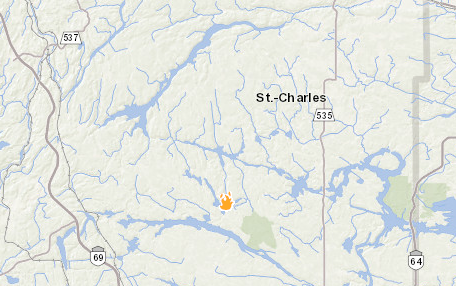 It's about 16 km southwest of St. Charles and still pretty small at 1 hectare. You can see where it is on the MNRF interactive map below.